Design Your Own Convertible Handbag and Studio Tour! Design your own bag and behind the scenes tour THIS SATURDAY (1/19)! 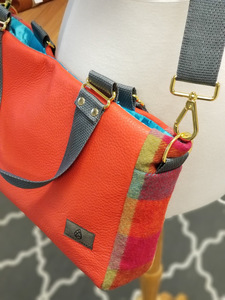 Join us to design your own one of a kind handbag by selecting from our premium upcycled materials, look in the eyes of the maker behind your favorite products, and take a tour of our production studio! At this event you'll work with our artist, Dea, to design your own convertible handbag. You pick the fabrics, hardware, straps, label, etc. and following the event, Dea will handcraft your bag out of your individual selections. Hear from a few members of our team about their journey through addiction, recovery, and employment and why you are making a difference for women. Just by participating, you are creating pathways toward economic independence and sustained sobriety. Your investment has enabled 100% of the women on our payroll to remain sober! In addition, you'll get a behind the scenes tour of our production studio and hear the story of how our 501c3 nonprofit social enterprise came to be. Join us and carry something that matters! Please note: You'll receive the finished bag that you designed approximately 2 weeks after the design session. Click here to register - fee $150. Unshattered is a 501c3 nonprofit social enterprise employing women who are winning their fight against addiction.